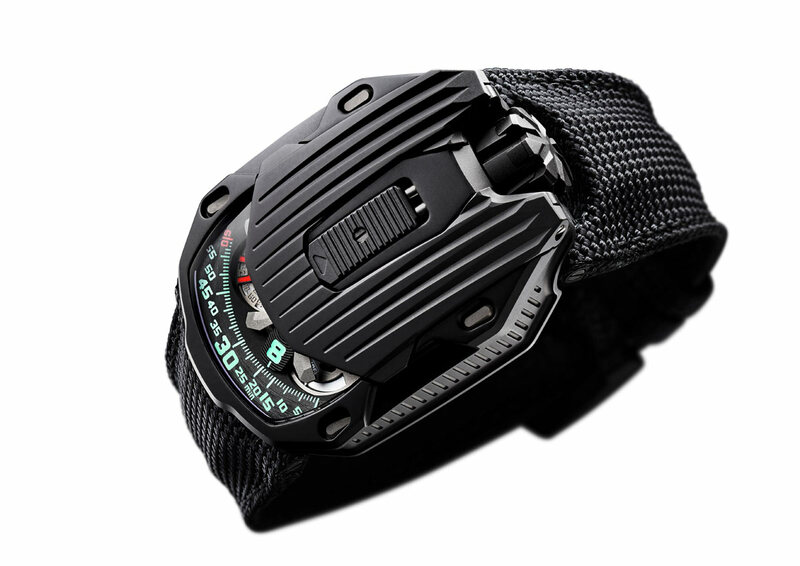 Luminosity is at the heart of Urwerk‘s latest creation, the UR-105 CT Kryptonite. 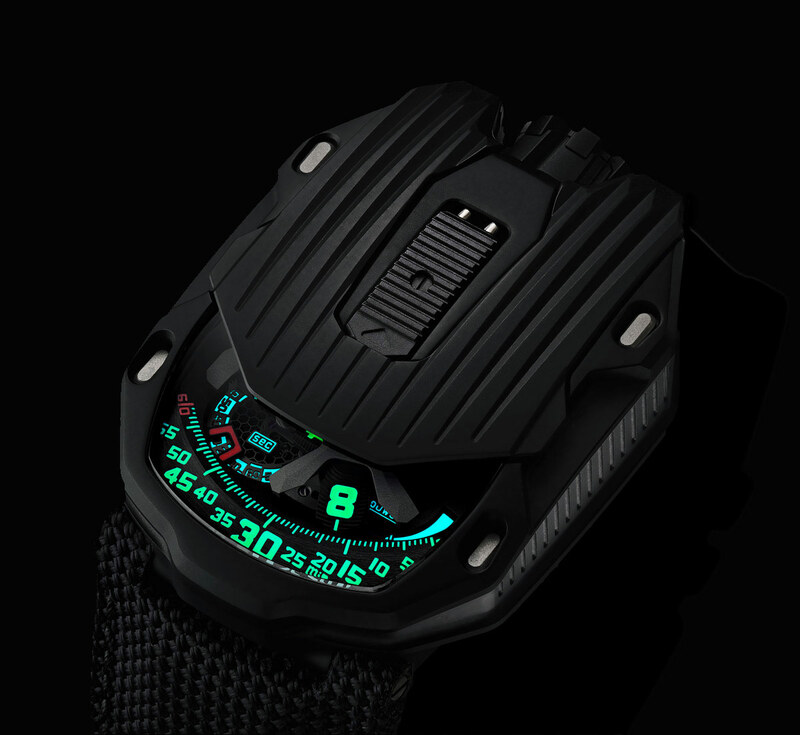 The intense green light emitted from the hour markers is the reason for the suggestive “Kryptonite” name. The vivid phosphorescence of the numerals creates a fascinating contrast with the matt, AlTiN-coated titanium case whose size is 39.5 mm x 53 mm x 17.3 mm. The AlTiN (aluminium titanium nitride) coating provides exceptional oxidation resistance and extreme hardness. When the cover on the top of the case is closed, only the time indication is visible. 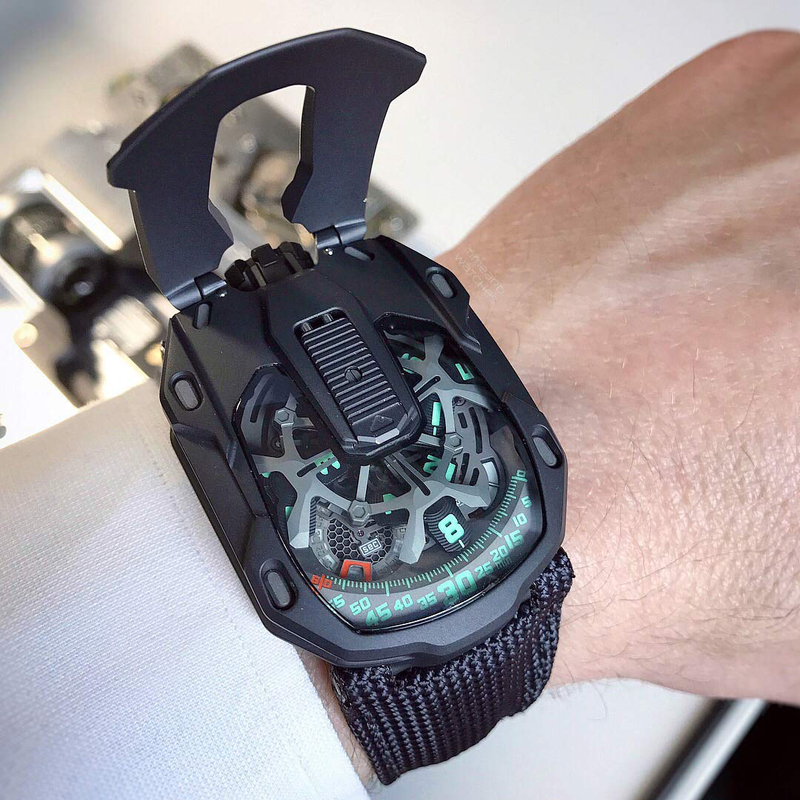 But if you slide the catch, the mechanism of the UR-105 CT Kryptonite reveals itself. It’s a wandering hour indication based on an openwork carousel, which carries the four satellites, each bearing three numerals for the hours. The hours successively sweep past the minutes scale for an analogue and digital display of the time. The dial also displays a power-reserve indicator and digital seconds with tens of seconds. The mechanism was made using a photolithographic process, with each marker openworked to make it as light as possible. It thus weighs less than a tenth of a gram. The self winding rate is governed by two pneumatic turbines and can be set with a lever. 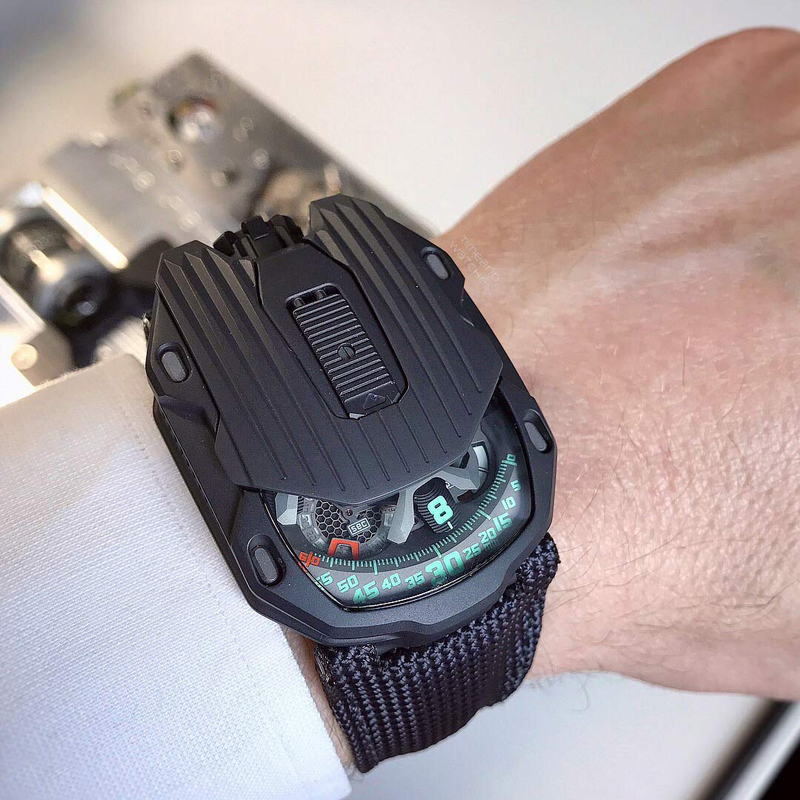 In the FULL position, the slightest movement of the wrist is harnessed to rewind the barrel spring. Turn the lever to STOP to disengage the selfwinding system and wind up the UR-105 using the crown. An intermediate position, RED (for reduced) engages the turbines to dampen the winding rotor and avoid overstressing the mainspring, if you are particularly active. 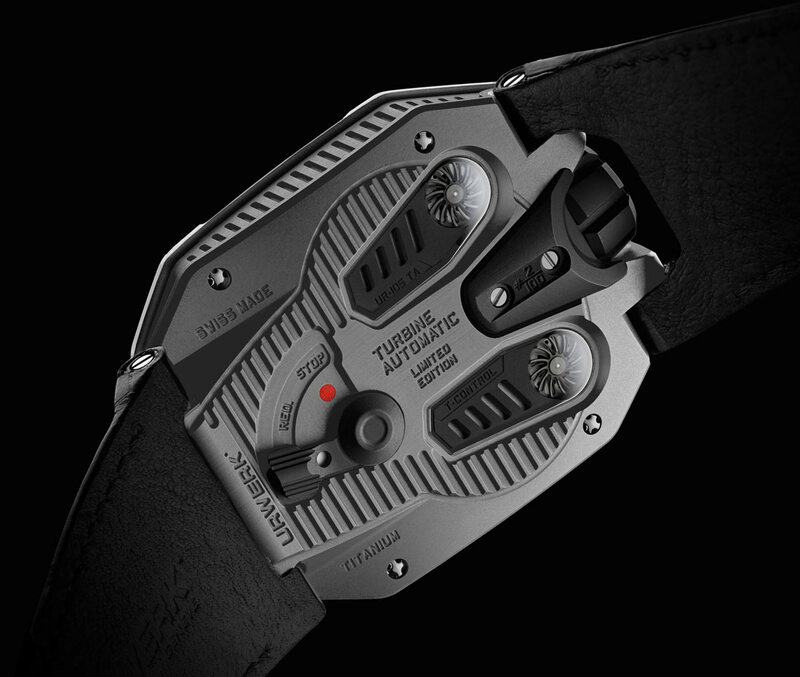 Beating at a frequency of 4 Hz (28,800 vph), the movement guarantees a power reserve of 48 hours. 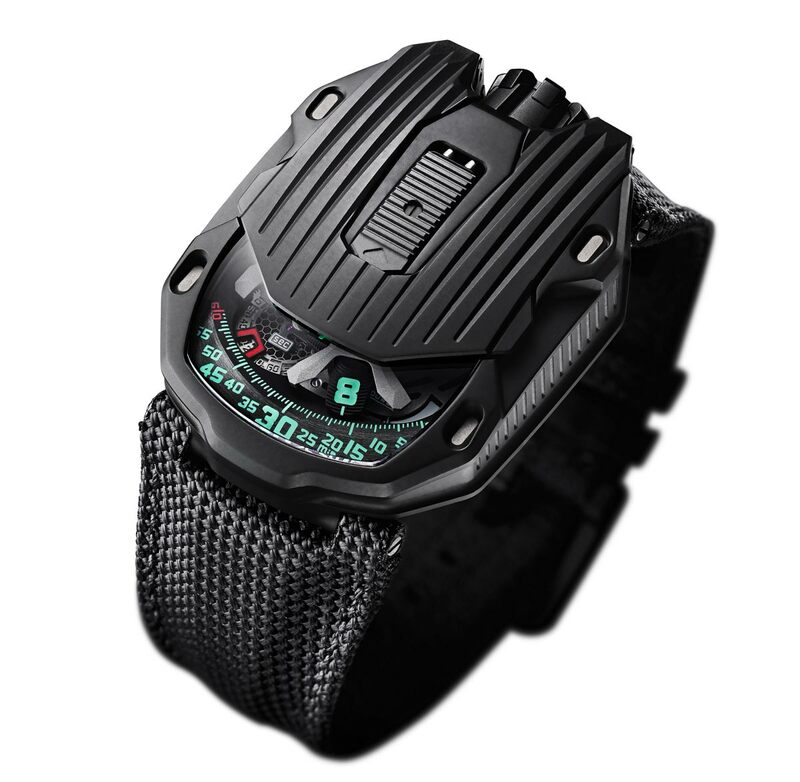 The price of the Urwerk UR-105 CT Kryptonite is Swiss Francs 65,000 before local taxes. Also you might be interested in Top 25 Luxury Watch Brands for Men.